I am so delighted and grateful to the ISNCC for nominating me for the 2017 Conference Scholarship Award to attend ICCN 2017 in Anaheim, California. The conference was really an unforgettable event for me, being the first time I will attend a gathering of nurses from all over the globe to share experiences and learn from young nurses and from leaders in cancer nursing. I had the great privilege to meet internationally recognized oncology academics and scholars that are not easily accessible in my country. I also want to express my deep appreciation to my mentor and my supervisor, Professor Sally Thorne who gave me the inspiration to apply for the scholarship award. I also acknowledge the support and encouragement given to me by Fuchsia Howard, an Assistant Professor, and my cosupervisor. 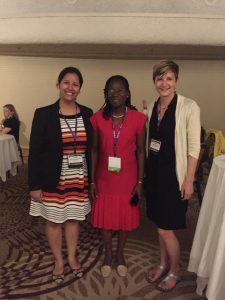 The first session I attended was the preconference workshop two about peer review for the academic journal where I what constitutes a quality peer review. This experience helped me to evaluate a couple of studies posted at the exhibition. I was inspired by the different, innovative ideas, new interventions, theories, and interesting research topics presented during the concurrent sessions. The experience has broadened my horizons and has equipped me with an advanced information about oncology nursing. I was challenged to reflect on the role of oncology nursing in knowledge translation and their activities to ensure that nurses deliver patient care by using the best available evidence across the globe. The plenary sessions and the concurrent session were all informative and educative. I have learned about different research interventions and findings. I learned about new evidence which may improve the nursing care of cancer patients and how research findings in nursing have advanced in nursing care of cancer patients. I gained experience in developing research topics and how to conduct studies that will be beneficial to cancer patients and my institution. It was amazing how nurses have advanced in knowledge translation across the globe. The postal exhibition was also interesting. Furthermore, the conference has provided me with the opportunities to learn, share, and connect with graduate nurses who specialize, my interaction with them has inspired my confidence in conducting nursing research. Finally, the conference has inspired me to take up the challenge of establishing a cancer nursing association in Nigeria to improve the nursing care of cancer patients and their families. Although an oncology nursing training is yet to be established in my country. The “meet your mentor” session provided me with an adequate information regarding the establishment of oncology nursing association. I intend to share my experience at the ICCN 2017 with the director of my institution, my colleagues and other nurses caring for oncology patients. Once again, I am grateful to ISNCC. Photo: Abosede Catherine Ojerinde is in the centre, between fellow scholarship recipients, Elaine Barros Ferreira and Angela Knox.